The Afghan Taliban has warned the United States against meeting "fake" and "fraudulent" insurgent delegations, saying such contacts could "seriously harm any possible genuine process of dialogue." The Islamist insurgency issued the warning following media reports of meetings between American and unidentified "high-ranking" Taliban officials in Dubai and Bagram, the largest U.S.-run military base in Afghanistan. Taliban spokesman Zabihullah Mujahid rejected the reports as completely false, and as rumors, saying neither any member of the insurgency nor any delegation visited Bagram or held talks with anyone in Dubai. In a statement sent to journalists Sunday, Mujahid emphasized again the insurgency operates its "Political Office" out of Qatar for diplomatic activities, and the United States and other countries are able to freely contact and visit them. "It is entirely possible that some self-interested individuals, for financial and other motives, could have tried to fool the Americans with such actions and posed as representatives of the Islamic Emirate to the Americans who have fallen for similar traps multiple times," Mujahid noted. The only known contact between the United States and the Taliban in several years took place last July when a senior State Department official for regional diplomacy, Alice Wells, held an "preliminary" round of talks with insurgent negotiators in their Qatar office. That meeting came after repeated Taliban calls for direct talks with Washington, and not with the Afghan government, to find a solution to the the conflict. The Taliban had described the Qatar meeting with Wells' delegation as productive.But the rare contact apparently failed to encourage further meetings between the two sides because there have been no signs of an Afghan peace process. Instead, the Taliban has intensified battlefield attacks attacks against U.S.-backed Afghan security forces, inflicting massive casualties on them and capturing new territory. While briefing the upper house of parliament or Senate on Sunday, Interior Minister Wais Ahmad Barmak disclosed that "daily 30 ANA (Afghan National Army) and police personnel get killed." Afghan Defense Minister Tariq Shah Bahrami told the Senate session that in the past month 513 ANA soldiers were killed and more than 7,00 injured. Afghan security forces lost around 14,000 personnel between April 2016 and July 2018, according to the U.S Special Inspector General for Afghanistan Reconstruction (SIGAR). Insurgent attacks have since intensified and inflicted more casualties on government forces. Washington wants a resolution to the war through an intra-Afghan dialogue, but the Taliban is averse to engaging in any peace talks with the Kabul government. The United States has recently appointed former diplomat Zalmay Khalilzad as its special advisor to Afghanistan to promote a negotiated end to the war. 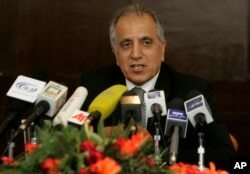 FILE - Zalmay Khalilzad, seen in this March 2009 file photo, has been named a U.S. special envoy to Afghanistan. In a letter to his team last week, Secretary of State Mike Pompeo said Khalilzad has been assigned to lead U.S. efforts to try to bring the Afghan government and the Taliban to a reconciliation. FILE - Secretary of State Mike Pompeo speaks about refugees as he makes a statement to the media, Sept. 17, 2018, at the State Department in Washington. 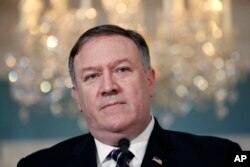 "Given the multitude of domestic and international stakeholders involved advancing a political settlement and the opportunities presented by President Trump's South Asia strategy, the creation of this position reflects the priority the Trump administration places on achieving a peace agreement, " Pompeo noted. Khalilzad, 67, born and raised in Afghanistan, served as U.S. ambassador to Kabul and Iraq during the administration of President George W. Bush.